Be the first person to stack and balance 5 dice on a craft stick, while holding the craft stick in your mouth. 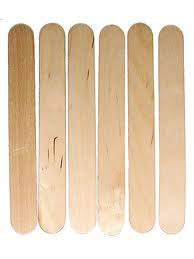 Craft Sticks are just oversized popsicle sticks. You can get them at any of your local craft stores. You will recognize them, they are the tongue depressors our doctors use when they want us to "say ah." I like to get my dice at the dollar store. Usually I can get 10 for a dollar. You can also raid a few of the board games that you have around the house. 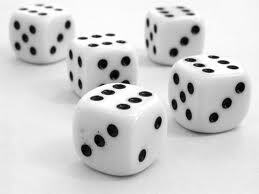 The dice do not have to be traditional with dots. It doesn't matter what is on them as long as they are the traditional size. Give each player a craft stick and 5 dice. Then, each player picks up their dice, and vertically stacks them, one at a time, on their craft stick. Forming a tower 5 dice high. Players are not allowed to let the dice rest against their nose or touch any part of their face. The first person to stack the dice while holding the craft stick in their mouth, wins. Anyone have a brush for that morning hair? If you don't have enough dice sitting around for everyone to have 5. Take turns, timing everyone as they go. The person with the fastest time wins. This is also fun because then you get to watch everyone else. You can also play to see who can stack the most dice, vertically on their craft stick. Oooh, I'll have to play this one with my niece, she'll get a kick out of it!